Frequently students, clients, or observers to Permanent Makeup procedures will become somewhat taken aback that there is blood involved with our procedures. There are those that even fear fainting from the sign of the smallest amount of blood, theirs or others. I believe that through the influence of violent or medically oriented television programs and gory films, blood has gotten a bad rap. Blood is good. Just as with too much of anything, too much blood is an indication that something is wrong. But even that isn’t all bad if you know when to consider it a big red stop sign. It just might indicate if you go further you could do some damage, or just that fighting your client’s body at that particular time is a waste of your time. 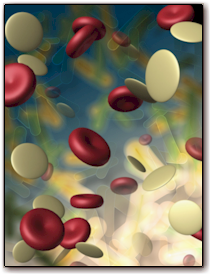 Blood and lymph supply nourishes the skin. Without blood, there would be no healing and without healing, no one would be a good candidate for procedures. Blood, specifically the amount of or absence of it, is a measurement of where you are in the skin, too shallow (no blood at all) or too deep (too much blood). You will learn from experience what to expect from a healthy client whose blood composition has not been affected by blood thinning substances. Blood is also a good measurement of how the skin tissue is holding up to the procedure. Again, too much blood might be a good indication that you are overworking the skin. Leave the area alone until the blood and lymph supply has a chance to do a bit of healing before you approach that area again, or I should say IF you approach that area again during the same procedure. These types of judgment calls come from experience and you have to do procedures to get experience. There is no way around it. In summary, blood in reasonable amounts in relationship to the procedure you are performing is a normal part of the process. Blood is good and expected in minimal quantities associated with breaking of the skin and implanting pigment. It is a good measurement of where you are in the skin, and how the skin is holding up to the procedure. Blood is not good in quantities that indicate you are overworking the skin, the skin is not healthy enough to work on, or that your client’s blood may be too thin in composition to perform certain procedures safely and or effectively. On the flip side of good blood, always remember that blood also spreads disease, some deadly in nature. You must follow OSHA guidelines associated with blood borne pathogen exposure at all times and above all, use common sense.